Senior Shiloh Carozza had never written a two act play before. She had written novels and stories, but “Between the Lines” was her first full play. 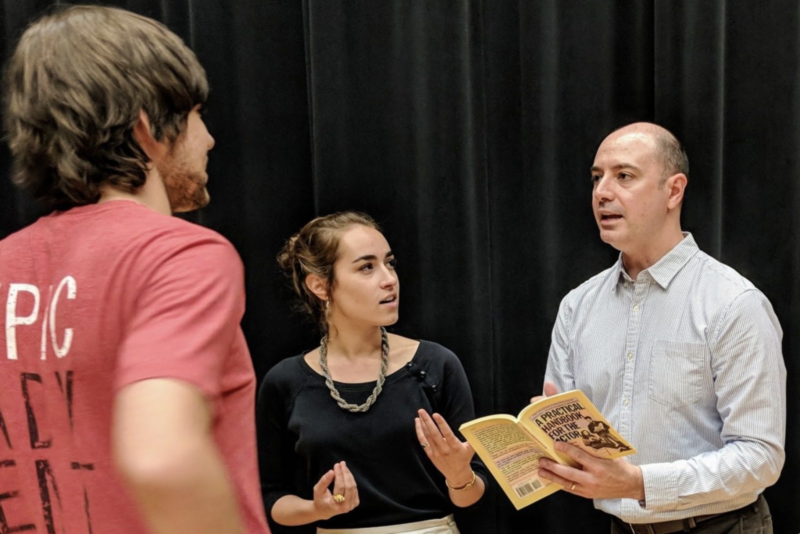 After months of working and writing, Carozza’s new play, which explores the theme of cen­sorship of the press set against the his­torical backdrop of the English Civil Wars in the mid-1600s, was show­cased in a staged reading on March 22. In 1643, England was split between Par­liament and the monarchy, divided between Roy­alists (Cav­a­liers) and Par­lia­men­tarians (Round­heads). It was in this era that Carozza created the story of Inspector Nicholas Hackle (Dylan Strehle) and Louisa Greaves (Sarah Nolting). Louisa is a Cav­alier and Hackle is an avid Roundhead who used to be a Cav­alier. Using her knowledge of his secret and evi­dence that could jeop­ardize Hackle’s life and position as a Roundhead Inspector for the Par­liament, Louisa black­mails him into mar­rying her. She promises that if he keeps her safe, she will keep his secret safe. This mar­riage is a strange sham, but both have the pro­tection they need from each other, and pursue their sep­arate goals. Hackle fights against the Roy­alist uprisings and tries to sniff out his nemesis, the infamous “Con­stantine,” a writer whose inflam­matory pam­phlets lead Roy­alists to protest in the streets. The play builds to its climax after Hackle arrests printer Samuel Hemsworth, who had been printing some of the pam­phlets for the mys­te­rious Con­stantine. Going behind her husband’s back, Louisa takes a par­ticular interest in the poor printer and saves him. Both Louisa and Hemsworth are Cav­a­liers, and a romance blossoms. Though she is still in her sham mar­riage to Hackle, she becomes pregnant with Hemsworth’s child. But before Hackle learns about the preg­nancy, Hemsworth and Louisa are caught in the midst of a riot, in which Hemsworth is killed and Louisa is hurt and loses the child. Hackle, further con­fused about the strange woman that he was black­mailed into mar­rying when he finds out about the ille­git­imate child, is called away to sup­press more uprisings but suffers a gout attack while he is away. With the Cav­a­liers all but knocking down his door, Hackle’s doctor and Louisa save him. Hackle sur­vives, but the doctor — and pre­sumably Louisa — do not survive the angry mobs. As Hackle ponders Louisa and Con­stantine and finds a cor­re­lation. When she was ill, Con­stantine had stopped writing. Her hand­writing is the same as Constantine’s. 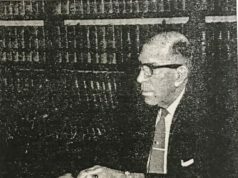 He sud­denly realizes that Louisa was the fiery Con­stantine, the author of the inflam­matory pam­phlets, using his pro­tection to try to pre­serve freedom of speech through her words. Without naming her, he explains to his supe­riors that the trou­blesome Con­stantine is finally dead. But Louisa re-enters in the last scene. She is not dead, but parts from Hackle and frees him by telling him where to find the evi­dence she had against him. It is this type of unre­solved ending that Carozza said she is drawn to. “When I write, I usually like to write about things that haunt me and don’t leave me with a sense of closure,” Carozza said. The idea of having a story about two people in a rela­tionship that neither of them wanted to be in, but each had to be in for his own respective reasons, was an idea that had been bouncing around Carozza’s head since her senior year of high school. She liked the way the idea haunted her and she knew that was the type of story she could really care about. Carozza wrote the play for George Angell’s, Pro­fessor Emeritus of Theatre and Dance, Play­writing class which requires stu­dents to write a full length play, 1.5 – 2 hours, or around 105 – 125 pages. “George told us, ‘Whatever you write about it’s going to be a two act show, so it has to be some­thing you care about,’” Carozza said. She realized she wanted to write the story that had been with her for several years. “Shiloh put untold hours of work in the project. She and Judy and I met twice per week for 2-hour ses­sions, dis­cussing, trou­bleshooting and devil’s-advocating the work as it was created and rewritten many times over,” Angell said. Carozza’s passion for writing and the story she created was evident in the fact that she was not tech­ni­cally required to have a staged reading since she is a rhetoric and public address major and not a theatre major. She went beyond the assignment require­ments for the play­writing class and worked hard, but enjoyed it. “This is probably the most ful­filling project I have ever gotten to do my entire life,” Carozza said after the reading was fin­ished. But even with the reading done, she still plans to keep working on her script after she grad­uates. “Long term, I want to go into screen­writing and or play­writing,” Carozza said. She said she would like to keep revising the script with the audience feedback, and perhaps even­tually have a private stage pro­duction of it. the author of this article should know more than anyone else at hillsdale that it is very dan­gerous to accuse others of “cen­sorship”. The author’s brother?/relative?, Ben Liebing, attempted to do so at the Cincinnati Enquirer and it blew up in his face. After accusing the paper of soft cen­sorship, it was revealed that he hadn’t been on assignment as much as his peers and that he fun­da­men­tally missed the mark with those that he accused. He decided to quit the field after he burned all of his bridges.